Newhaven is a slightly run-down harbor town with a busy ferry port in East Sussex, England. Though the town is home to a mixed demographic, there are marked areas of poverty and deprivation. As with many of Sussex’s grand coastal towns that have fallen into disrepair, the picture was very different in the Victorian period. During the late 19th century, Newhaven was a thriving town. Good transport links and the rail and ferry services brought wealthy Victorians to the area, and the luxurious London and Paris Hotel was known for its glamorous gatherings. The town is now a friendly, down-to-earth place with a strong sense of community, but looking around at the streets and buildings, it’s hard to imagine it as a fashionable Victorian destination. In recent years, the area has received government funding as part of an effort to regenerate the town and port. A new University Technical College campus is being built on the site of the old Marine and Carpenter’s Workshops in Newhaven Harbor, due to open in September 2015, with the intention of breathing new life into the town and offering vocational qualifications to young people. In what is quite a ground-breaking decision, the District Council, one of the partners of this project, commissioned me to document the progress of the renovations in an ‘artistic’ manner. This is a deliberate move on the part of local council to keep local people included in the changes and show the developments from a more ‘human-centered’ perspective and not simply a corporate one. The local community have been included in the process from the off-set and are consulted regularly. As the chief executive of Lewes District Council, Jenny Rowlands told me: “We felt it was important to document the transformation of the Grade 2 listed Marine and Carpenters’ workshops in Newhaven into the new University Technical College, linking its former use to its future use, as part of Lewes District Council’s commitment to regenerate the town whilst respecting its port town heritage. "[Your]" inspiring photographs give residents, students, community groups and project stakeholders a unique and regular ‘behind the scenes’ view of the development as it happens." A selection of the photographs will be on permanent display in UTC@harbourside when it opens in September. In other ways, also, the development is being sensitively managed: The beautiful old buildings had an iconic status, and the outer shell as well as some of the original structural features are being kept; the key subjects studied at the new college will continue the traditional use of the building. My role within the project is unique in a number of ways. Although I have been commissioned by the council, I am not one of their employees, so I can remain independent. In the same way, I have access to the construction process, but I am independent of the building firm running the project. This is important to my role as communicator to the local community, giving an inside view of the process to those who will be impacted by the changes happening on the site but who do not have access to it. Additionally, I am a woman entering into a predominantly male world, and an artist entering into the physical/mechanical and corporate world of the construction business. There is only one other woman on site, Vicky the crane driver. Apart from being one of only three female crane drivers in the country, Vicky has also forged important connections with the local community and is another bridge between the site and the town. She joined a residents’ Facebook page, although she does not live locally, and writes and posts photos on it regularly. The project’s press office has used her as a good role model for an engineering college that is working to encourage girls to enroll. On an artistic level, this has been a fascinating and challenging project for me. I know a lot about this site. I was photographing here before any works were started, so I have detailed references to the changes that the buildings are undergoing. Once the building works started, I was not allowed to wander around the site on my own but had to be escorted at all times. This has restricted how I photograph, but over the months I have figured out how to make the most of my time. My approach to photographing this project is that I enter the site with my eyes open – to everything. I try never to plan what I will photograph and to just be attuned to my environment. The light and spaces in the Marine and Carpenters buildings are continually changing -- with the seasons, with the weather and through the process of the building works. I look for shapes, colors and textures, for quirks in perspective, for dust, fog and anything else that make the spaces transparent or opaque, for small details both ordinary and extraordinary. When the builders moved in, they became as much a part of my work as the building itself. Photographing the workers often allows me to show the dynamic, unexpected and surprising elements of a building site. I visited one winter afternoon with the sun glowing low in the sky. Inside the Carpenter’s Workshop, I was disoriented by the way the sunlight bounced off the interior space. It reminded me of how light can shimmer and shift on the walls of a swimming pool. It was not until I was home and examining my photos that I guessed the source of the confusing light. The sun must have been bouncing off the surface of the river that flows right outside the building. The windows were being lit by the low setting sun as well as by the reflections off the water. I loved how this created doubles of the beautiful arched shapes on the brick walls. I then noticed another set of doubles. The sun was low enough to cast shadows of the two bricklayers so that the men and their silhouettes were almost side by side. Perhaps it is the transitory nature of the site that I most look to photograph. That setting I just described was only momentary – the quality of the light, the location of the bricklayers. The beautiful arched windows, bare brick walls and dirt floor are no longer. New windows to the same shape are arriving soon. The walls have been insulated, flood protected and boarded over. The floor is now insulated and covered in concrete. On every visit the site is different. If I did not photograph it then those changes would go undocumented and there would not be a sense of a continuum from the past to the present and on to the future. I think it is these emotional connections that help us to accept change and value what has been and what is to come, to keep the healthy relationship and connection between past and present, between architecture and people, between corporate, government and community. These things are possible when organizations approach projects with the understanding that a human or heart-centered business model is much more likely to reap tangible rewards and benefit local people than an insular, profit-centered model. Since the Tory government’s austerity measures, many of the plans for regeneration in deprived areas have been shelved, but projects like this can make a huge difference to communities. The local people bring a real understanding of local need and the developer brings the skills necessary to effectively manage the renovation. If there is conflict, the potential benefits of regeneration may be diluted. Projects are only sustainable if the local community use and benefit from them, and this happens when local people are consulted and heard. What I find particularly pioneering in Newhaven is the unusual level of care that is far from corporate. Scroll down for more of Carlotta Luke's photographs of the renovation process at Newhaven Harbor. You can read more about this project and see more of Carlotta’s photographs here. Carlotta Luke is an art and documentary photographer based in Lewes, in the South East of England. Known for her photographs of HM The Queen and the UK band Mumford & Sons, Carlotta is no stranger to celebrity snapping, but she is also drawn to working environments and architecture for her inspiration. 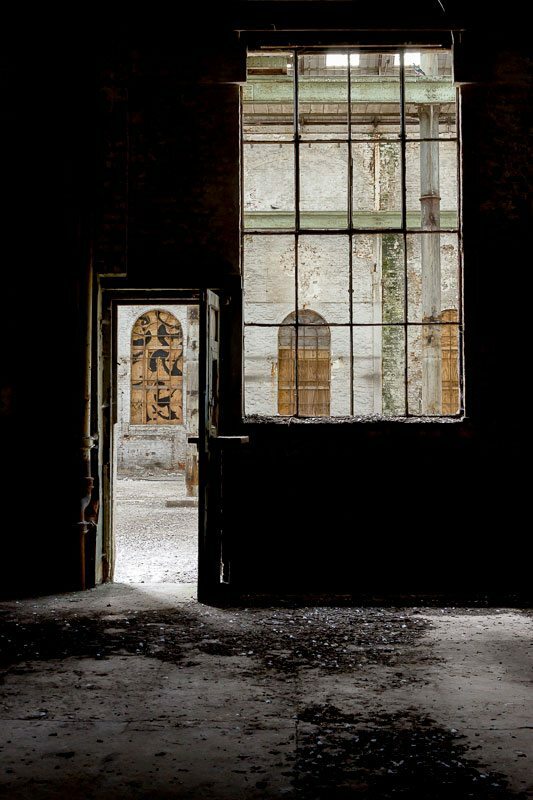 Here Carlotta writes about her most recent project, to document the regeneration process of two derelict historic marine buildings in a local town.